Nate’s first contact with drones was shooting them out of the air with surface-to-air missiles in the US Navy. Later, Nate served as an operator on one of the US government’s largest “drones,” a 420-foot Navy destroyer being used as an unmanned self-defense test ship operated via remote control to support self-defense engineering, testing, and evaluation. 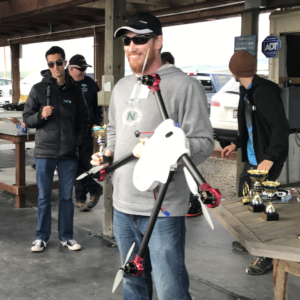 Now a veteran in the private sector, Nate became passionate about FPV drones in 2013 with his first Parrot AR drone, and he has since built and flown more than 30 different aircraft and served as support staff for Drone Worlds, Drone Nationals, Aerial Sports League, and numerous other drone racing events.